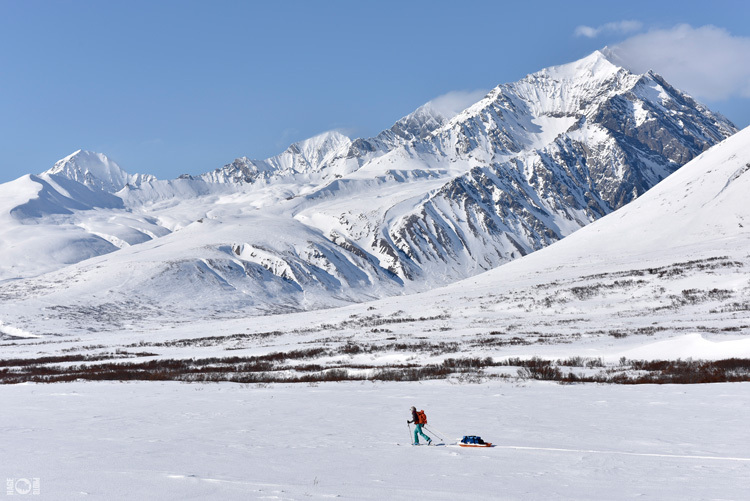 Agnes towing her sled past mountains in Denali Natl Park. My sled dredged a trench behind me. 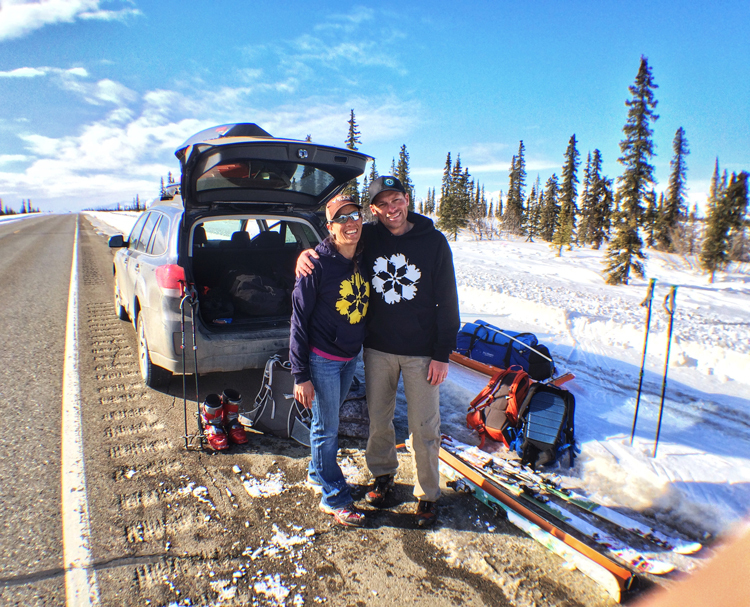 When we arrived at the parking lot after the four hour drive from Anchorage and unpacked our ski gear, I came to a bit of an embarrassing realization. The skins I’d borrowed from APU’s gear room were six inches too short for my skis (my mistake, not theirs). I’d spent an entire day methodically preparing for the outing, and now here I was at the very start of it without one of the most essential pieces of gear I would need. 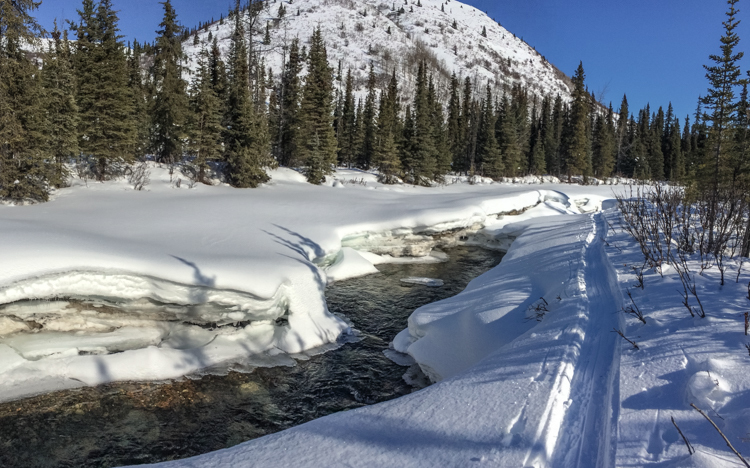 Skins provide skis with one-directional traction that sticks to the snow when pushed backward and glides as the skis move forward. Without them, there isn’t a point in even leaving the parking lot. Yet, we’d driven four hours, and the idea of turning around was so impossible that it inspired the Hages to engineer their way through the problem. Two ski straps and a small roll of duct tape later, my skis seemed like they might just be capable of travel. The problem seemingly solved, we set off. The duct tape on my skis disintegrated. The metal edges sliced right through the stuff like termites through a rotting floor. Thankfully, the ski straps proved to be holding up with more integrity, and the skins were still working…for now. During a three-week glacier trip last year, I had serious blister trouble. A week in, maraschino colored blisters appeared on the insides of my heels. Several days later, they popped and new blisters formed beneath the tenderized skin. 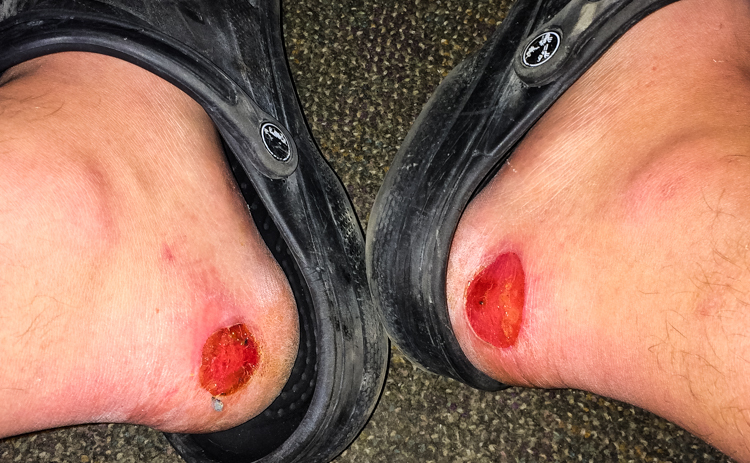 By trip’s end, I had a blister inside a blister, inside a blister on both heels. With those grueling weeks in mind, I had purchased a surplus of blister prevention and treatment supplies from the local drugstore before heading out on the ski tour. When the insides of my heels began to feel tender less than a mile in, I didn’t think much of it. Last time, it had taken a week for the sores to form, so I assumed I would be fine for only four days. I figured I would cover the hot spots with 2nd skin and tape when I got to camp that night. No worries, right? As I pulled my right foot out of my boot liner after setting up my tent, a sharp hot pain shot through my heel. I gently peeled the sock away from the skin, uncovering a beet-red, open blister the size of a half dollar. Ouch. I moved on to unbuckle the other boot, and a similar wave of pain told me the left heel would be just as bad. I sighed and forced myself to relax. Eventually, my eyes wandered to where I’d left my skis. One ski strap was gone, and a foot or so of the skin drooped away from the ski. 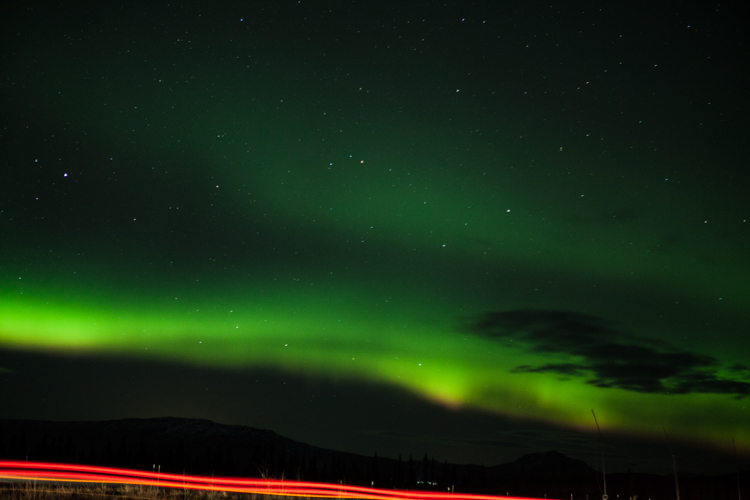 At least the wait in Healy wasn’t too dull. Still looking for the trucker who’s taillights photo-bombed this shot. I pride myself on my ability to maintain a positive perspective—to view mistakes and failures of character as learning opportunities instead of regrets. Yet, as I sat in the car after departing the Hages a day after we’d first set out, I couldn’t shake the frustration. When I made the decision to turn back, I insisted the Hages continue, so they could do the work they had intended to produce during the tour. We discussed the plan. 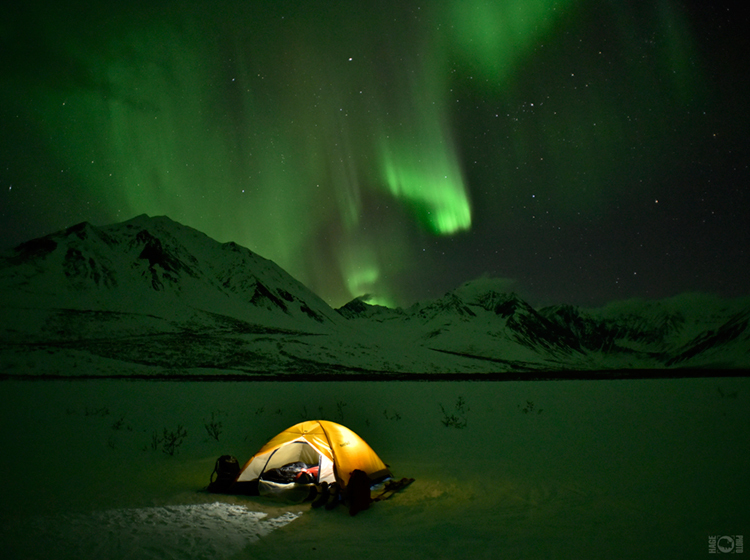 I would return to the car and spend the next two nights in small town Healy, and they would complete the circuit. Before heading our separate directions, we looked over the map and discussed where I would pick them up. As I entered the waypoint into my iPhone’s GPS app, Agnes recounted a time when friends they’d once relied on to pick them up hadn’t shown. Tired of waiting at the pickup spot, their ride drove into the next town and made them hitch. The point, I was told, was to be at the pickup area any time before 2pm, when they expected to arrive. Apparently the view was OK in the mountains too. Two days later, I was determined to make up for the blister and gear blunders, so I left Healy at 11AM. I pulled into a parking lot near where they would come out at noon. Traditionally in the wilderness, navigation is conducted with map and compass, and were that the case I would have probably driven up and down the highway looking for them when 2pm rolled around. Instead, when Matt sent me an iPhone screenshot of their location at 1:45pm, I guessed where they would come out, plotted a waypoint on my phone and drove to it. They showed up a few minutes later. Maybe being there right where they come out of the woods isn’t exactly making up for bringing the wrong skins, but it’s a helluva lot better than making them hitch to the next town. This is what being stoked not to hitchhike with skis and packs looks like.